If you're tired of romaine and mixed greens, it's time to break out of your lettuce rut with this easy arugula salad recipe. Arugula has a peppery punch that's like a wake-up call to your palate. Baby arugula is perfect here because it's milder and more delicate than mature arugula, which can be overly assertive. 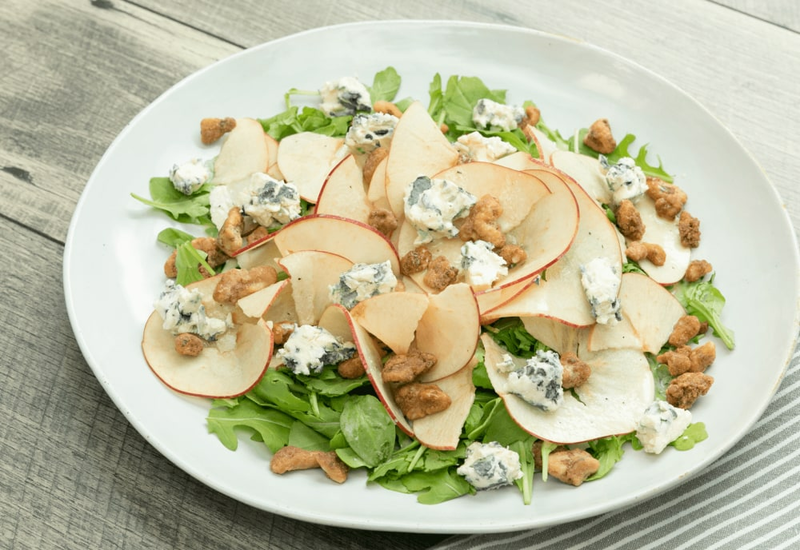 Combine the leaves with crisp, sweet apple, toasted walnuts, and salty blue cheese. Then toss it all with a quick, creamy dressing that adds a great tang. The combo will have you craving bite after bite—and who couldn't stand to eat more salad? Per Serving: 450 calories; 34g fat; 27.9g carbohydrates; 13g protein; 26mg cholesterol; 937mg sodium. Such a good salad! The spiralized apples are perfect. I also added spinach with the arugula for my salad. So delicious. This is a very delicious salad. I love finding new ways to use my spiralizer. Making ribbons with the apples was so cool! Also, very good dressing and the blue cheese crumbles was the icing on the cake. My husband even loves this salad, although I have do use very mild blue cheese since it's not his favorite. I usually make a similar salad to this, but the spiralized, thin apples and the roasted walnuts were a nice change. Definitely making this again! I used yogurt instead of mayonnaise for the dressing, like in the video. Also, instead of spirlalizing the apple, I just sliced it very thin. This was super simple! I made this with baby spinach instead of arugula. It was delicious! I also added some gorgonzola in addition to the blue cheese. Yummy!